I'm sure by now that all of you have seen the new Catching Fire teaser preview from MTV. If by any chance you haven't, head over to our video page (button on bar above) or click here. It's Effie! We love her new blue look.. with shoulder-pads! 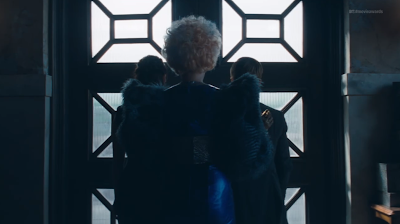 Even though we're only seeing her from the back, you can tell she looks very Capitol. Notice how she gives an excited little "jump" when Katniss and Peeta's names are called! This is a great little touch by Elizabeth Banks, and very much in the character of Effie. Over her protruding shoulders we catch a glimpse of the two victors from behind. See Peeta's shorter hairstyle, and notice that we can see the top of Katniss' right ear, which suggests that her hair is braided or styled in some way. What could the mysterious items on the table to the right be? Now here is an interesting shot. While the first 2 scenes are connected, this is probably a different scene, seeing as Katniss' hair is now down covering her ears. 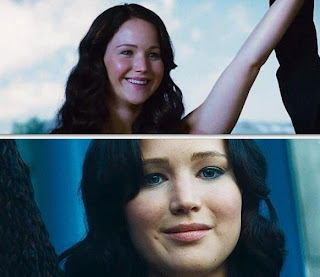 Her arm is raised into the air by an unknown character (Peeta? ), to the cheer of a crowd. 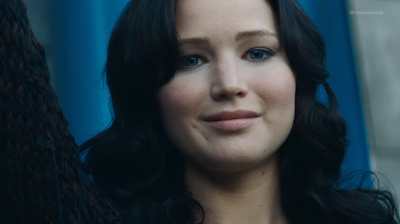 We can see that Katniss is trying to smile, but really cannot manage it for some reason. 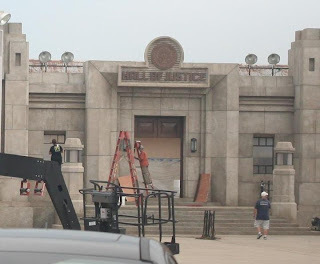 See here for a comparison to a very similar scene in THG. This is a great example of the acting talents of Jennifer Lawrence. It is really incredible how she can portray such clear emotional torment in a single facial expression. Notice how her hair colour is actually navy blue here. 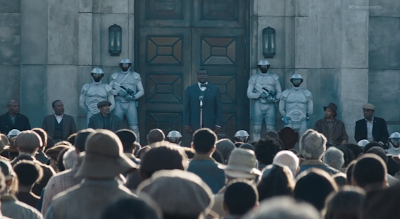 There is a lot of the colour blue in this preview: members of the D11 crowd, Effie's outfit, the Victory Tour banners in the background etc. What could this colour represent? Perhaps Francis Lawrence could be honouring the previous 74th Hunger Games, as blue was it's colour (Caesar Flickerman's hair). Thanks to YouTube user Allie Elmendorf for the comment! Let us know your comments, we'd love to hear from you. Don't forget to share!